The landscape of Chicago, while in a continuous state of change, has been perhaps most strikingly changed in the area east of the Chicago River. Looking from Ping Tom Memorial Park towards Downtown Chicago with the St. Charles Air Line Bridge in the foreground. 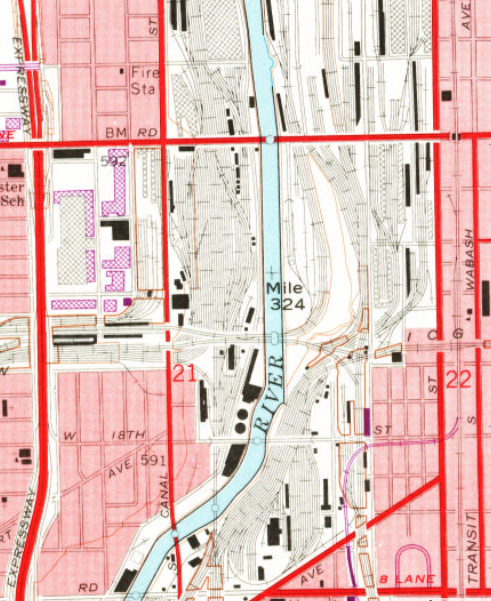 As late as the 1970's, the east side of the Chicago River was almost nothing but various railyards and railroad property, easily identifiable in topo maps from the region. It's quite easy to see just from satellite imagery just how the area has changed, as areas where the rails were once king have given way to new parks, shopping centers, movie theaters and residential buildings. This isn't just unique to Chicago, as Pittsburgh is another example of ongoing redevelopment along it's Allegheny River Waterfront. 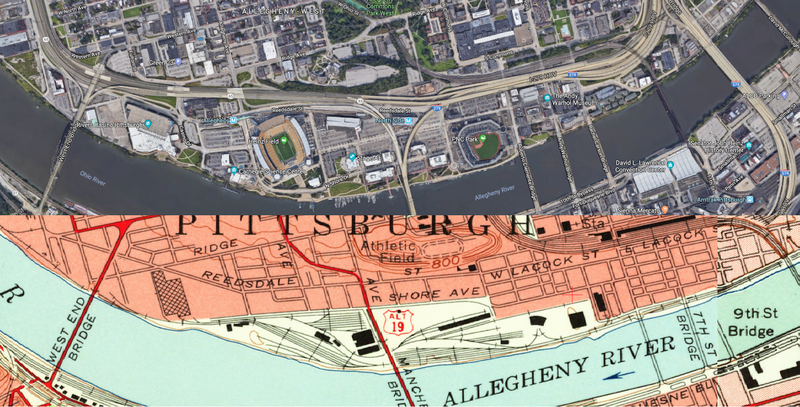 A casino, PNC Park, Heinz Stadium, and the Andy Warhol Museum all occupy what was once railyards at the south end of Pittsburgh. 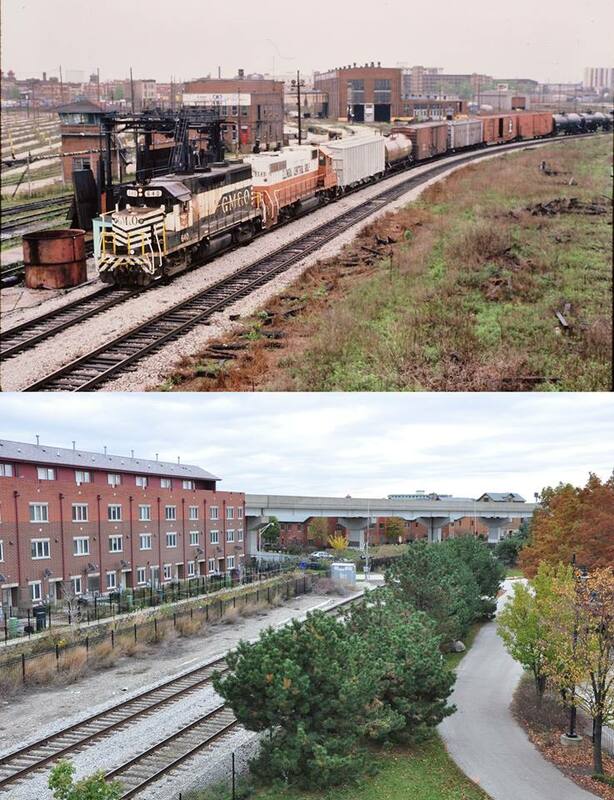 While it might be tempting to think of these abandonments of railroad property as an example of the rail industry's decline, it should be noted that today, railroads ship more tonnage than they ever have, and being able to shed large properties in major cities has provided them numerous economic benefits as well as property tax savings. 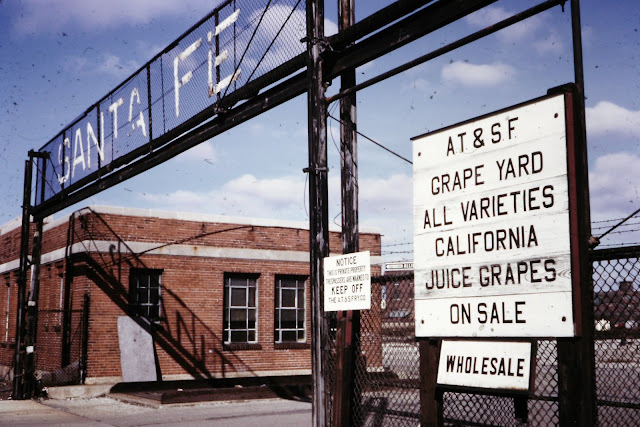 Today's blog focuses primarily on two places that didn't exist until the late 1980's and early 90's, after the Santa Fe Railroad sold off land to develop Ping Tom Memorial Park and Chinatown Square. Much has been written regarding the transition (trainsition?) from rail yard to urban destination. And indeed, the change has been quite striking. Construction of Chinatown Square: In 1984, civic leaders in the Chinatown neighborhood of Chicago, part of the Armour Square Community Area, planned to purchase a 32 acre site from the Santa Fe Railway to build a property which would act as a community gathering place, and include retail and restaurant developments, as well as housing. The idea faced many hurdles, including exactly who was going to clean up environmental contamination from the rail yard, as well as competition from others, including the USPS, vying for the property. Eventually, financing was secured, grants were given by the State of Illinois, and the project was completed in 1993. I've been visiting the area since I was a kid, and I was shocked to learn that it was once a railyard, as you'd be hard pressed to find any kind of clue of the ground's railroad history. Looking south at the square, which opens up to Archer Ave, while shops and businesses are north. One of two pagodas which lead to the second floor. Today, Chinatown Square is a two-story development bustling with restaurants and stores, although there are a few vacancies on the second floor. Nonetheless, it is an interesting and exciting place to visit and eat at the restaurants in the area. Joy Yee Noodle, known for their awesome smoothies, has a location here, near UIC on Halsted, as well as a few in the suburbs. Built west of Chinatown Square was a Walgreens, which was once home to the Santa Fe Grape Yard, known as such because it was an area where once could purchase fruits directly from the railroad. The same development group which purchased and created Chinatown Square was also partially responsible for the area immediately north of here, Ping Tom Memorial Park. Ping Tom was the founder of the development group which created Chinatown Square, and would also be instrumental in creating more open space in the Chinatown area. In conjunction with the Chicago Park District, the area north of Chinatown Square and residential areas would become a park. Tom would die in 1995 before this plan could fully come to fruition, and as such, the park was named in his memory. Located on the riverfront, it is much easier to tell that this area was once home to railroad development, as an active BNSF line runs through the park, one that is crossed at-grade to enter the park. Looking west entering the park. More activity can be seen west of the Chicago River, including Amtrak trains into Union Station. 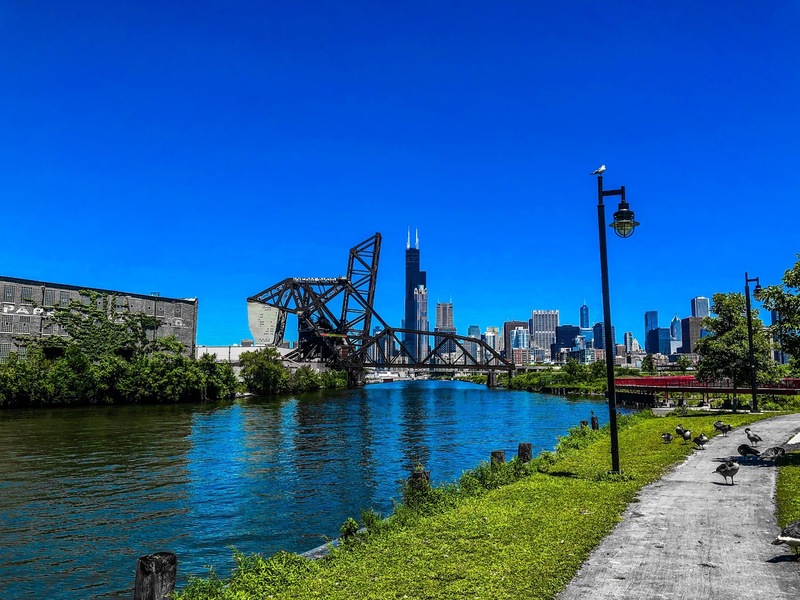 The park's boundaries are the Chicago River, the Canal St Railroad Bridge, Chinatown, Wentworth Ave, and the St. Charles Air Line Bride to the north, all of which can be seen very well from the park. Top & Bottom Images taken by Mark Llanuza, first in 1982 and then in 2013 of the area. I would think that Tom would have been pleased with the outcome of the park, as compared with the bustling Chinatown Square, it is tranquil and scenic. It's also a Water Taxi stop, so you're able to take a ride on the Chicago River to Downtown for a relatively low price. A pagoda shaped pavilion is the first thing park goers see after crossing the railroad tracks. Looking south along the river, you can easily see the very active Canal St Railroad Bridge from the park. One interesting thing about the park was that there was someone playing a flute like instrument near the 18th St bridge, adding to the calm atmosphere in the otherwise busy area immediately south and west of here. Memorial to Ping Tom, documenting his contribution to the creation of the park. Of course, we couldn't leave without taking pictures of ourselves! Thanks as always for reading, and as always, let us know what you thought, and if you have anything to add about Chinatown Square and Ping Tom Memorial Park! 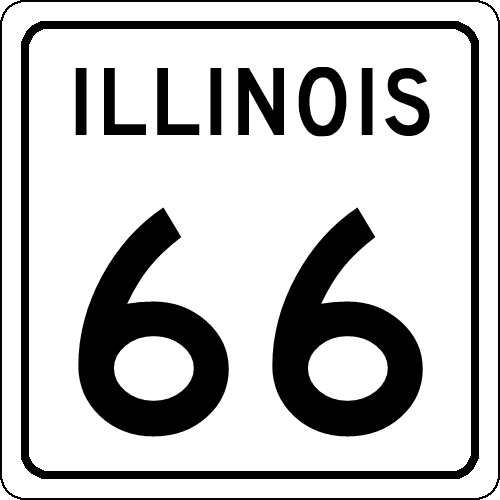 A hypothetical IL 66 Route Marker. As it would only be located in Illinois, a North-South cardinal direction would be more appropriate than former US-66's East-West designation. There are few, if any, roads as legendary as Route 66. 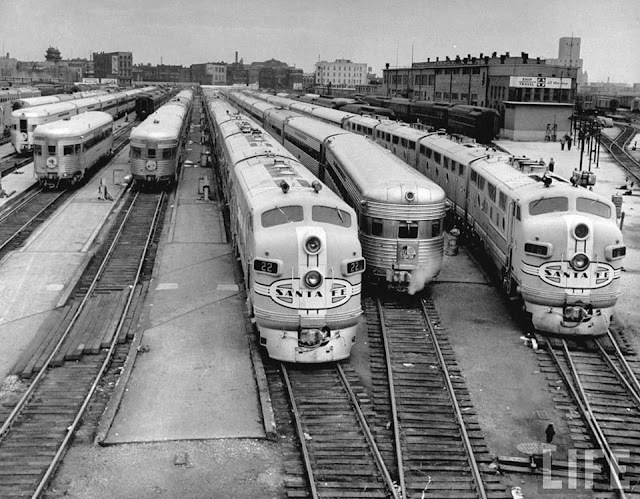 It is without question the road most firmly entrenched in mid-Century Americana, just as railroads were in the 19th Century. 66 is also a story of our changing road landscape. Built in the 1920's, and not fully paved until much later, The Mother Road was in a constant state of change and upgrading, not dissimilar to roads today. This map does a great job of documenting the changing route over time, much better than I could. Except that this change, and America's growing need to move faster throughout the United States, would make 66 expendable. The road was decommissioned fully in the 1980's, although it had shrunk in size much earlier. And yet, the story goes on. Much of the former road is still in service as different state and local roads. Those yearning for nostalgia and days gone flock to the pavement the road once called home. Signs have been erected showing where the route once ran, and in some cases, signs even show different alignments. Some states have even designated parts of their stretches of the road as State Route 66. I believe it's time Illinois did the same. Here is my proposal for a 297 mile long Illinois Route 66 between Chicago and St. Louis, and why I think it's a good idea. My route, as proposed, would use I-55's successor as little as possible, while at the same time, maintaining the safest non-freeway route between Chicago and St. Louis. The route I picked as a singular state route does not tell the story of Route 66 in it's entirety, nor does it set out to do so. It does not go through the tiny downtown areas of the small towns who owe their very existence to the route, although it does make them more accessible and navigable, better I believe than a historical route marker would. I welcome your thoughts and criticisms on where exactly the new route should travel. I am not alone in my conclusions, many people would love to see the entire Route 66 come back as a US Highway. I don't think that will happen, and perhaps it shouldn't, given how US Highway standards have improved over time. So now that I've established what I believe to be a workable route, the next step is to show that this isn't simply some pipe dream of mine, and there are real world examples of re-designation. 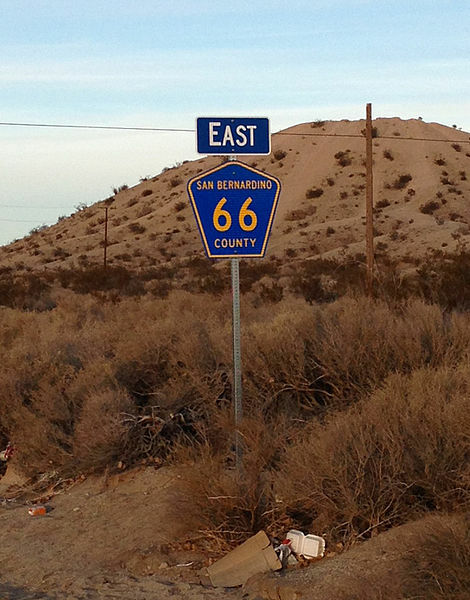 California signs a small section of their former US-66 as a State Route, as does San Bernadino County, Arizona, Oklahoma, Kansas and Missouri, so the idea to re-designate, in whole or in part, Route 66 as a state or county route is not without precedent. It should also be noted that Illinois hasn't used the number 66 as a state route since the 1930's. 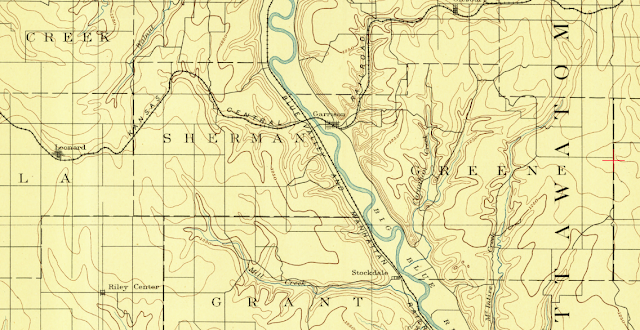 And while some parts of Route 66 have been renumbered as other routes, and some might say there is no point to adding a number to an already numbered road, large portions of the former alignments of Route 66 are completely unmarked as such. That also ignores the fact that Illinois did just that in 2010 as part of a plan to connect Chicago and Kansas City with a singular route designation. Illinois Route 110 is a second number on the many roads that the expressway uses. 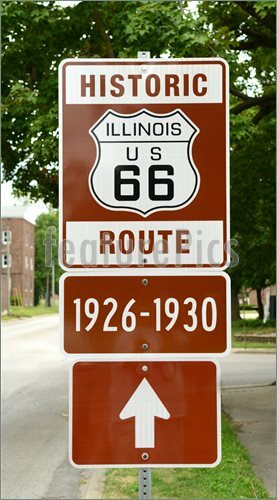 Illinois Route 66 would also add a little more prestige to the road currently, which has been used as a detour route when I-55 has been shut down as the result of an accident which is sadly an all too-common event. Having an actual state route as opposed to simply a historic designation would aid travelers on where to go in situations like this. The only way that 66 comes back as a State Route is if the people demand it. As such, contact IDOT and your local State Representative. There are few costs that would be required, other than signs and perhaps a small marketing campaign advertising the existence of the route, but the potential for positive economic impact to the communities along the route cannot be overlooked. especially good at changing things big and small to better suit our needs (or so we think, at least). Dams are some of the earliest examples of human ingenuity, allowing water retention and flood suppression, among a number of other benefits. However, quite a few dams have also displaced people, railroad lines, and even entire towns. Through my ongoing research on abandoned railroad lines, I began to discover there are quite a large amount of areas which look completely different before and after they were dammed. Here are some of what I'm sure are dozens more examples. All of these former settlements are on my Ghost Towns map, and can be found using the GPS Coordinates if you're interested in seeing what they look like today for yourself. 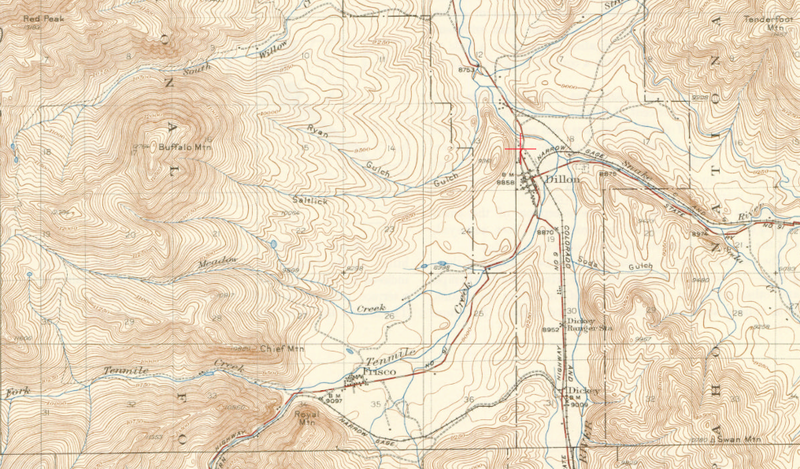 I also recommend checking out the USGS Topo Map Viewer, which will allow you to see these towns in greater detail. Callville, NV was the southernmost Mormon settlement, situated along the Colorado River. Established in 1864, the town was abandoned in 1869 after the US Military decommissioned the garrison located there, which was active during the Civil War. 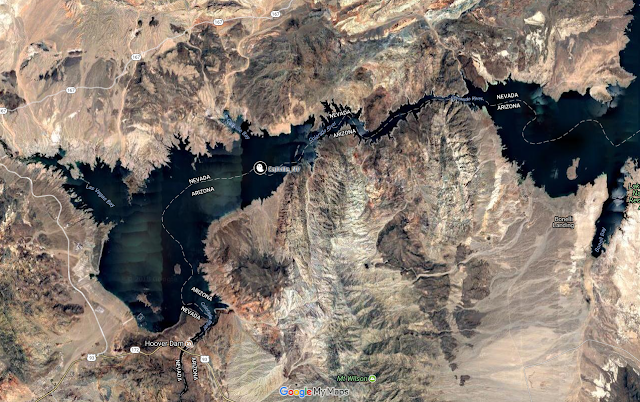 It was a one of a number of settlements along the Colorado River that were ultimately submerged several hundred feet underwater as a result of the building of the Hoover Dam and the creation of Lake Mead. 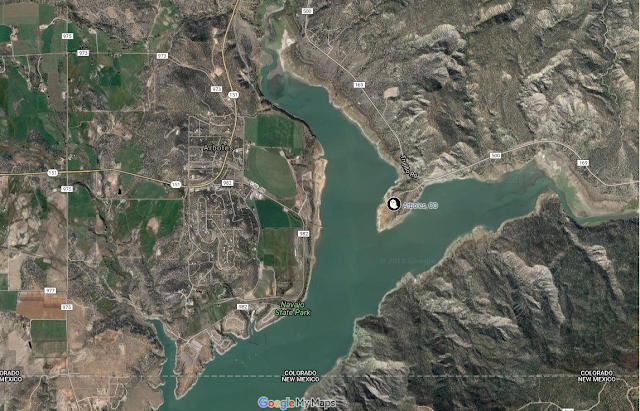 It is now directly north of the Arizona border within the lake. Google Maps Satellite View of the area today. While the town is gone forever, it should be noted that it had been a ghost town long before the dam was built, as the last structure in the town had been razed in 1892.
ran a line along the river between Elizabethton and Mountain City, TN. The building of the Kentucky Dam by the TVA in 1944 inundated the area of Johnsonville, TN. Residents relocated the town a new site south of the old Johnsonville, which was incorporated in 1949. This damming also necessitated relocating the Nashville Chattanooga & St. Louis line which ran between Camden and Denver, TN. 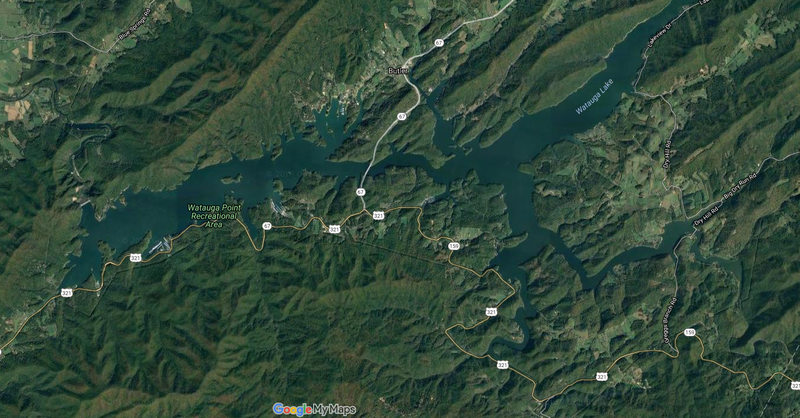 New Johnsonville has a population of roughly 2000 people, so this is a case where the relocation of the town most likely helped it survive. All Settlements along the Gunnison River. 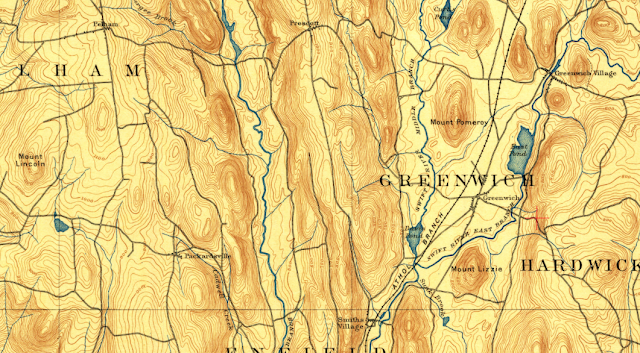 Source: Uncomprahenge 1908 USGS Topo Map. The damming of the Gunnison River displaced many former town sites, which were all laid out on the Denver & Rio Grande Western Railroad, which itself was abandoned when the Blue Mesa Reservoir was built in the early 1960's. The town of Iola still had an active post office at that time. 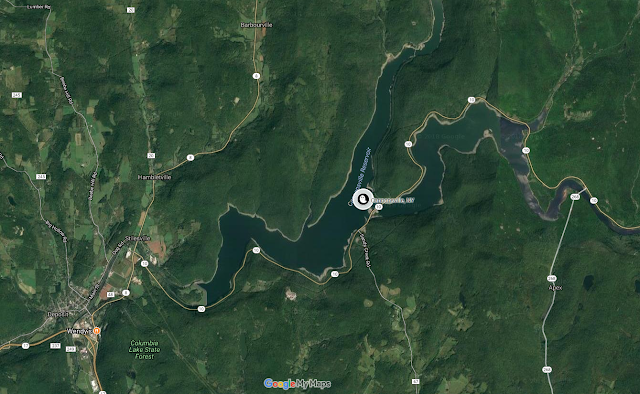 Google Maps showing the location of the former town sites now underwater. 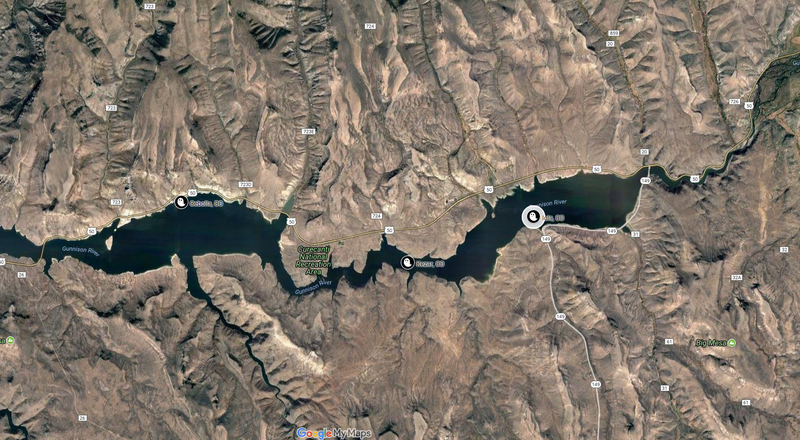 Most of the former residents of these towns likely moved to Cimmaron or Gunnison, west or east respectively, of the dams. Colorado comes up a lot with regard to former towns being inundated for dams, which makes sense given the ongoing scarcity of water in the Western US. 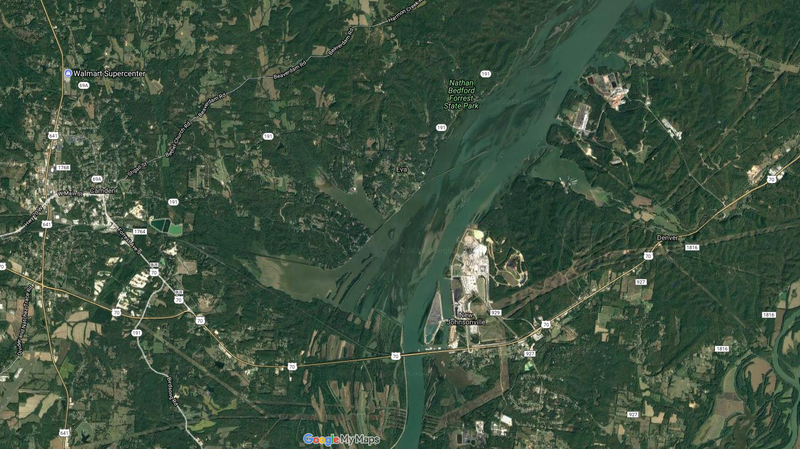 Much like Johnsonville, TN, Dillon exists today, but has been relocated about a mile north, after the Dillon Reservoir was built. 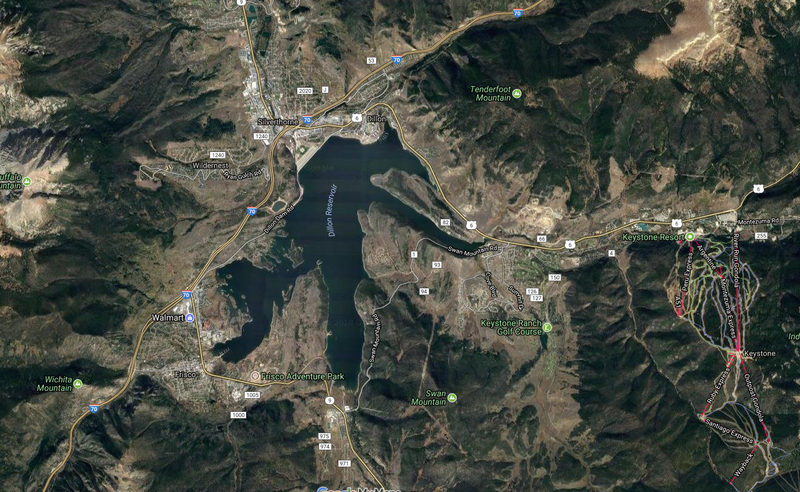 The area is much more populated today, and includes the towns of Silverthorne, located just north of the tourist destination Breckenridge, CO.
Colorado shows up once more on this list, this time immediately north of the New Mexico border along the San Juan River. Arboles was relocated west of the river after the construction of the Navajo Reservoir and Dam a few miles south, which began in 1958. 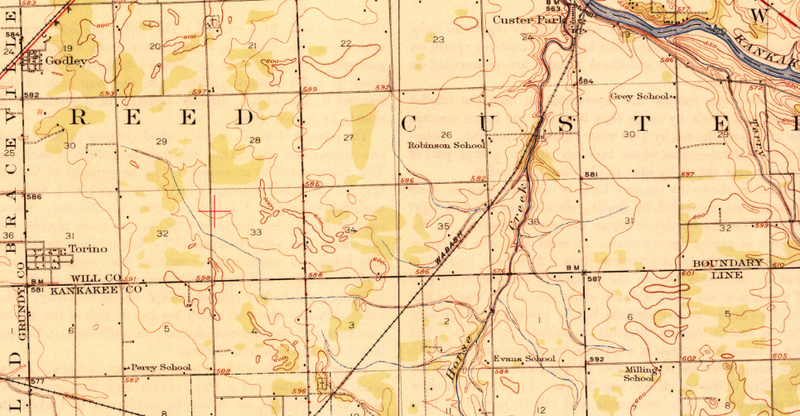 This also forced the Denver & Rio Grande Western to abandoned their line between Carbon Jct and Chama, NM. There are more examples I'm sure of towns gone in Colorado, but let's move to the east, shall we? Before the creation of Tuttle Creek Lake, a village known as Garrison existed in Pottawatomie County, KS. Founded in 1880, it was incorporated until 1959 when it was razed to make way for the Tuttle Creek Lake. Thankfully, there has been some history saved of the town as a result of Kansas State University's research. Not one, but two railroads actually ran through Garrison. 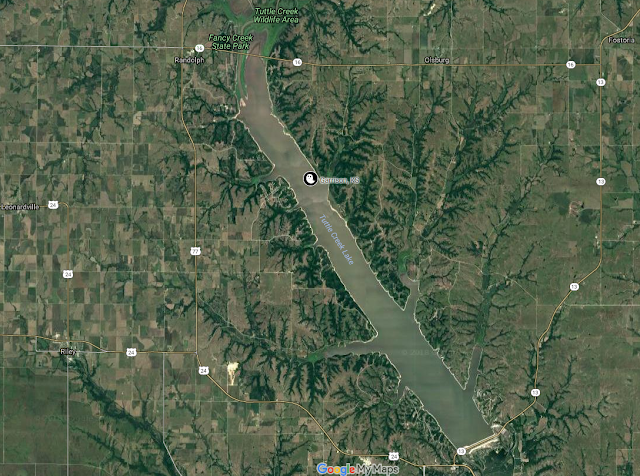 The Kansas Central, later becoming the Union Pacific, ran east-west between Miltonvale and Valley Falls, KS, and the Blue Valley and Manhattan Railroad ran along the Big Blue River in a north-south path, which I need to find more information on. Both railroads are obviously long gone today. Google My Maps of the area today. While Torino is unique on this list in that it was not abandoned as a result of damming, it is underwater along with the rest of these villages. At the far southern end of Will County, IL where it meets with Grundy and Kankakee County, Torino was a boomtown when coal was king in the area in the early 20th Century, according to David A. Belden in his book on Will County. 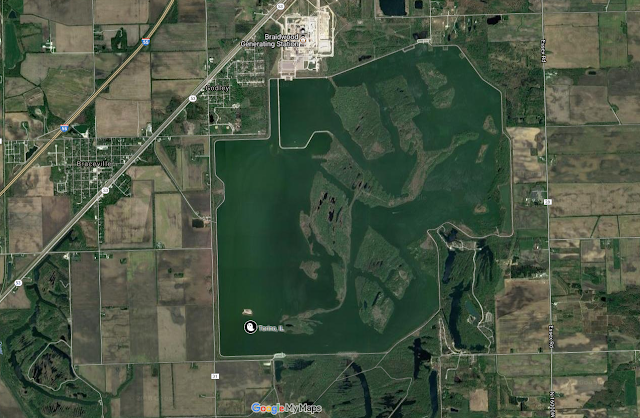 The town site is now within the cooling lake created for the Braidwood Nuclear Generating Station which was built after the town was gone. 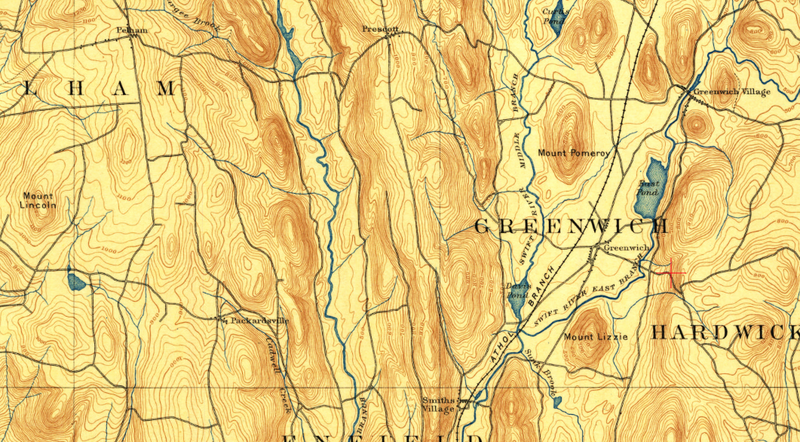 Located in Upstate New York, Cannonsville was founded late in the 18th century, making it one of the oldest towns on this list, and survived until 1964, until the area was flooded to create the Cannonsville Reservoir along the West Branch of the Delaware River. Credited with "saving New York City" by providing drinking water to the region, the dam was breached in 2015, which required diverting water away from the river to prevent a catastrophe downstream. Thankfully, disaster was prevented in that case, but it is a good example of a large part of our infrastructure which requires ongoing maintenance, that few of us think about on a daily basis. Last on our list is the town lost to create the Quabbin Reservoir, which serves as water for the Boston area as well as much of the state. Greenwich was founded in 1739, making it by far the oldest town on this list. 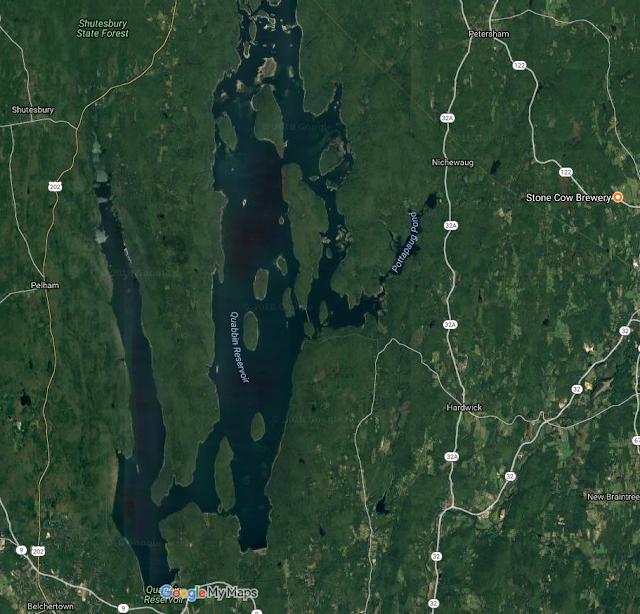 The Quabbin Reservoir was built in 1938, making Greenwich last for 199 years. The construction of the reservoir also required abandoning the Boston & Albany Railroad's Athol Branch. Know of another town or area which looks completely different today as a result of damming? Let me know in the comments as always, and thank you for reading! But even this doesn't tell the whole story, as it leaves out the nameless I-57, which usually is discussed once the expressways on the hand have been mentioned, and the Chicago Skyway, which is almost never mentioned on traffic reports other than when there's an incident on the road. Still, two other highways were proposed to be integral parts of the City's road infrastructure, and these roads are the subject of today's blog. Quite possibly the most famous unbuilt expressway in Chicago, The Crosstown has been planned as various facilities since Daniel Burnham's 1909 plan of Chicago. The proposal that came closest to reality would have had the expressway run from the current Junction (where the Edens and Kennedy split for you non-Chicagoans) on the north side, along a railroad right-of-way, in fact the same one I proposed a bike path in last week, down to Midway Airport, then veering left at the Belt Railway of Chicago's yard in Bedford Park, heading east around the 75th St area before meeting up again with I-94, now as the Bishop Ford, which is the route I have mapped below. 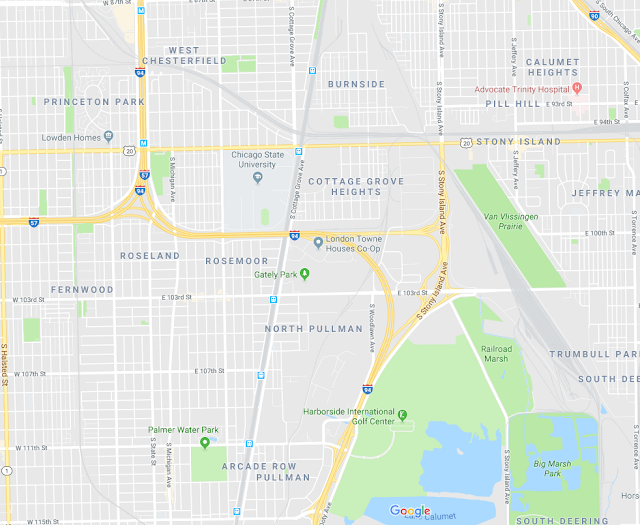 While it was proposed to become I-494, there's no reason it couldn't have split up the I-90/I-94 combo for the Kennedy and a good portion of the Dan Ryan, but in any case, renumbering roads is an entirely different discussion. 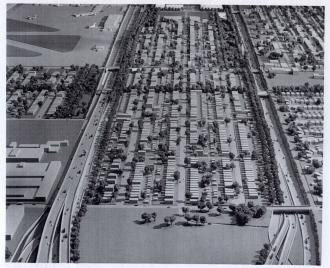 This proposal for The Crosstown was proposed in the 1960's, and this coincided with a growing skepticism regarding urban freeways. Even the best proposals for the road would have required thousands of housing units be demolished to make way for it. Whether or not the road would be built was a pivotal issue in the 1972 Illinois Gubernatorial Election, in which anti-Crosstown Democrat Dan Walker narrowly beat incumbent Republican Richard Ogilvie. So what would the Crosstown, if it was built, look like? It would likely have had fewer interchanges than the Kennedy, and allow for traffic to bypass downtown. 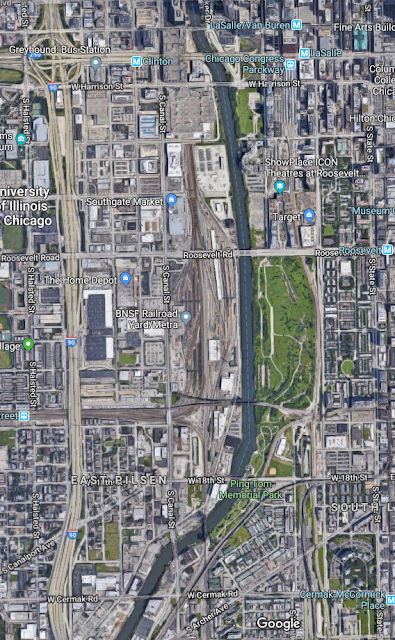 I could guess interchanges coming from the north would be at North Ave, I-290, Ogden Ave, I-55, somewhere near Midway, 67th St, Western Ave and Halsted St, before ending at the Dan Ryan. Would the Crosstown even have had a positive impact on traffic flow? While I'm not an engineer, I think if you look at other urban expressway proposals that have been built, and their impact on traffic, it's safe to say that it would have a very positive effect on downtown traffic, especially on the Kennedy. But that's pretty much where the positives end. The Crosstown would likely have moved the congestion backups from the center of Downtown Chicago to the Junction, where three interstates would condense to two, where traffic is already horrendous. Additionally, both I-55 and I-290 would have choke points at their interchanges as well. I should note that The Crosstown is not completely a dead project. In fact, proposals using similar rights-of-way to the project such as the Mid-City Transitway, and a Toll Highway have been proposed as late as 2007. But I would not hold my breath that any freeway project will be built in the area anytime soon, as any proposals are sure to face local opposition, funding concerns, and environmental impacts. While local opposition was the ultimate killer of the Crosstown, there existed yet another expressway proposal within Chicago's city limits. This one is much older, and unlike The Crosstown, not only were small parts of it built, they exist to this day. Before the freeway network was built in Chicago, the arterial roads were the only way to get around. 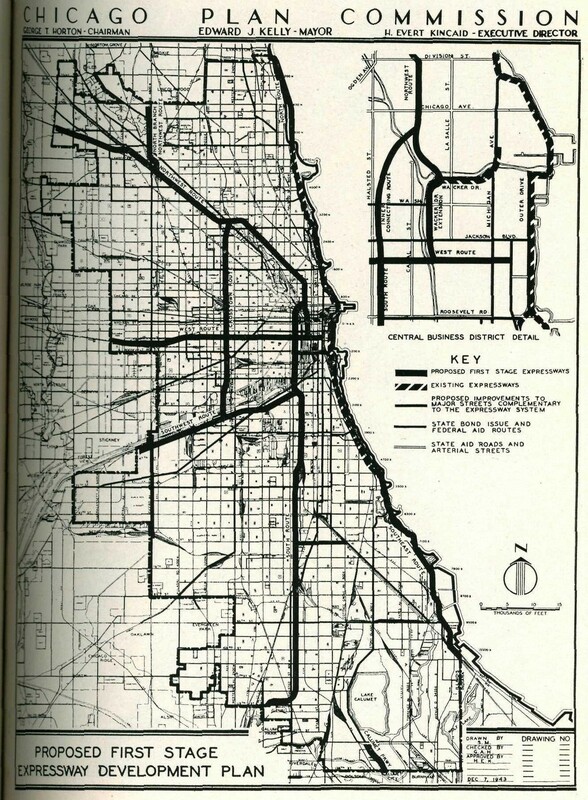 And unlike today, many arterial roads in Chicago carried numerical designations. 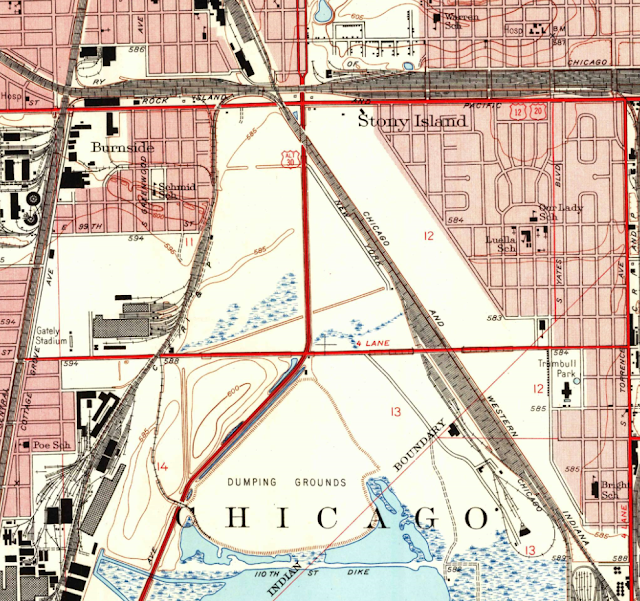 In the case of Stony Island Ave, it along with the Calumet Expy (today's Bishop Ford Freeway) was designated as ALT-US-30. All traffic on the Calumet was routed onto Stony Island Ave, as the Bishop Ford hadn't been built yet. A proposal in the 1950's had Stony Island Ave become an expressway, and thus the Stony Island Feeder Ramp was built. No longer numbered, Stony Island Ave is nonetheless still a large arterial road on the South Side of Chicago. 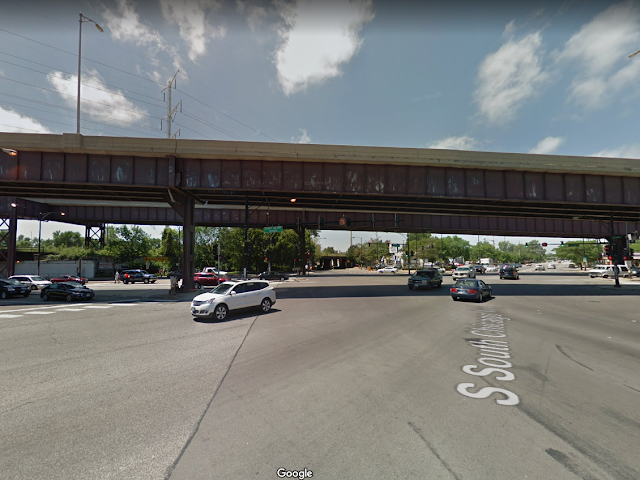 Built as ALT-US-30 to move traffic from the Calumet Expy onto the Stony Island Expy, it would have replaced Stony Island Ave as an arterial road up to about 57th St, and turned east to connect to Lake Shore Dr, which itself was proposed to become a full expressway as part of this proposal. 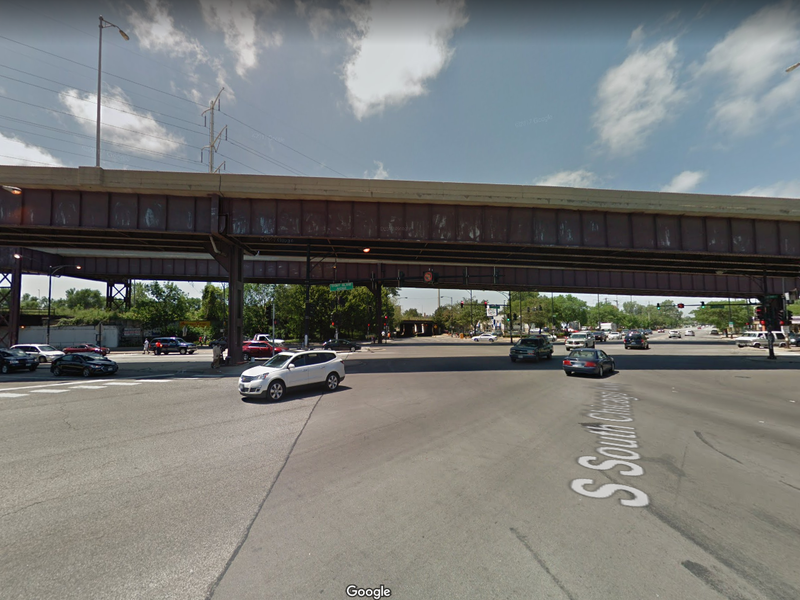 This freeway was proposed to become I-494, but when that number was moved over to The Crosstown, this was proposed to become I-694. Another ghost of this expressway exists as well. 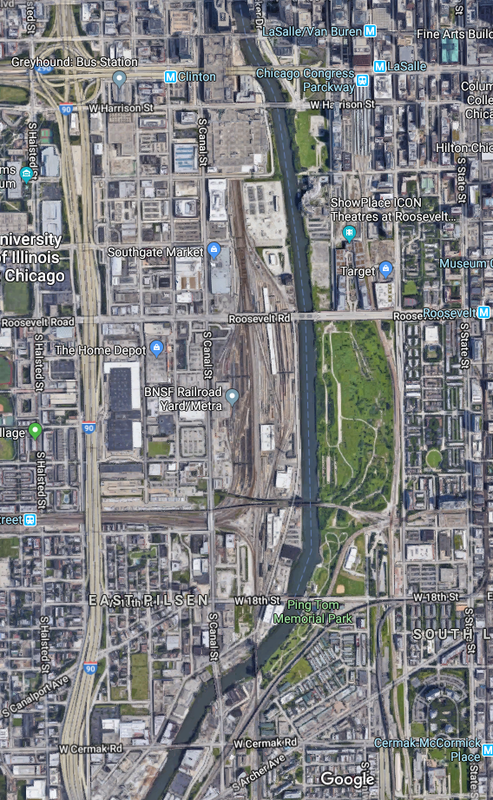 The Chicago Skyway's interchange with Stony Island has two large flyover ramps, which seems odd for an arterial roadway, and that's because they were originally designed to connect to Stony Island as an expressway. Much like The Crosstown, The Stony Island Expressway would have had problems of it's own with land acquisition. 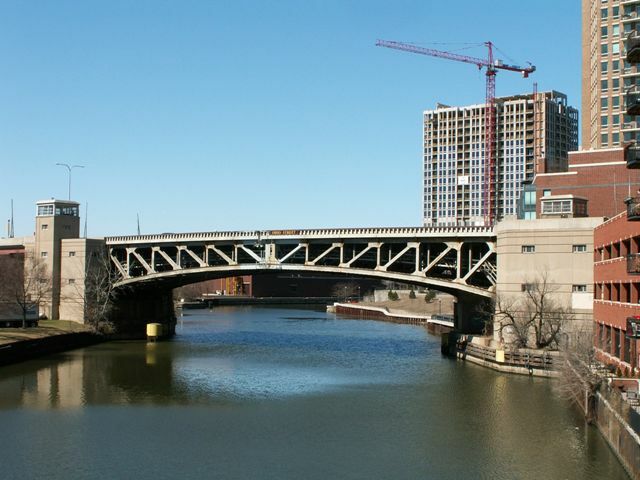 Although Stony Island Ave is wide and could support an expressway (without getting into how that would affect the local neighborhood), the project would have had trouble connecting to Lake Shore Dr, as it would run right through Jackson Park, the Midway Plaisance, and the Museum of Science and Industry. It was thus canceled in 1959, and traffic was routed onto the Bishop Ford Fwy instead. Yet another ghost, if built entirely, would have connected the Kennedy Expy with the Lake Shore Expy, creating an inner belt of traffic around The Loop; The Ohio Street Feeder, which is currently built as 3 lanes in each direction from the Kennedy to just past the Chicago River, about 1 mile in each direction. The center of this project, Lake Shore Dr as a full freeway has been a non-starter every time that it has been proposed to be upgraded. 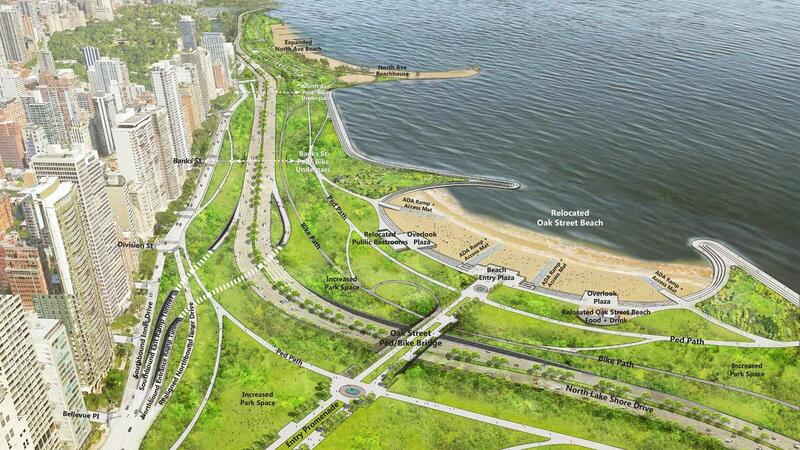 But it is nonetheless still being proposed to be reconstructed, but part of this newest plan would involve adding more beach are to the Lakefront, as well as smoothing out the Oak Street curve, which currently reduces traffic to 25 mph. It's almost certainly for the best that neither The Crosstown nor the Stony Island/Lake Shore expressways were built, for the fact that urban freeways displace communities, are inherently more expensive than freeways in less dense areas, don't really improve travel times (if at all), and have environmental impacts as well. As this blog was on simply the proposals of the roads themselves, I specifically chose not to delve into these topics, but that doesn't mean these issues don't exist; much has been written on the negative impacts of urban freeways, as well as the history of the roads that have been built in Chicago, and how they were built along racial lines, and accelerated white flight outside cities.